Delhi-based start-up Sabziwala aims to eliminate the middleman, while providing customers with pre-weighed and pre-packed fruit and vegetables. Three months ago, Rajesh Kumar, a grocery shop owner in South Delhi's Vasant Kunj, added a new line of business - perishables like fruits and vegetables. All he has done is reserve some space to display the fresh produce he gets from a city-based start-up, Sabziwala. to his doorstep. Whatever is unsold is taken back next morning. Kumar just pays for the quantity that has been sold, after deducting his commission. Sabziwala, the brainchild of former IAS officer Pravesh Sharma, is trying to redefine agri-marketing in a manner never attempted before. Unlike dozens of other online marketplaces that offer home delivery of fresh produce to consumers by bypassing existing retail channels, Sabziwala uses existing outlets, vegetable vendors and grocery shops to sell its branded vegetables. While most retail suppliers, including retail chains, source their produce from mandis, Sabziwala gets most of its produce, especially vegetables, directly from farmers and farmer producer organisations that operate within a 100-km radius of its distribution centre in Delhi's Dwarka sub-city daily. Kumar claims there is huge customer interest in Sabziwala, and he would love to have more stocks as the current stock is not sufficient to last the whole day. Can India, a nation home to the world's largest vegetarian population, afford to waste 30 per cent of the fresh fruits and vegetables it produces? Can Indian farmers' income from fresh produce be increased from the current level of 25 per cent of the consumer end price to 50 per cent? These were some of the thoughts that led Sharma to establish Sabziwala in June 2016. 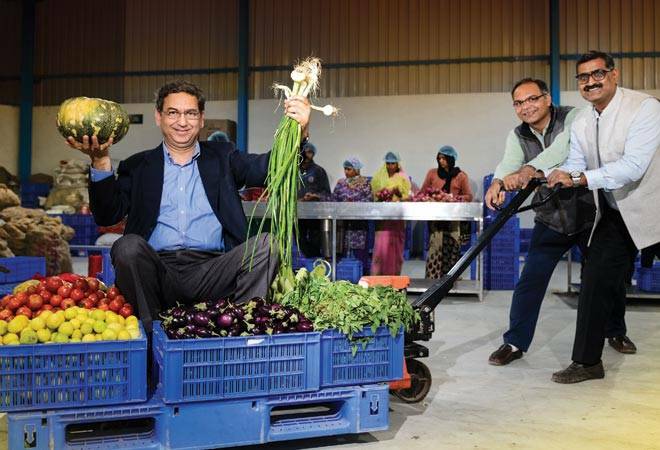 Sharma and the company's co-founder Alok Srivastava, an agri-professional, are trying to cut out the existing seven to eight layers of middlemen in the fruits and vegetables trade, and connect farmers' produce to the neighbourhood push cart, street-side hawker and the kirana store. "Ninety five per cent of India's vegetables and fruits are sold by push vendors. We only want to help them provide better produce to the consumer, at a transparent and predictable cost," says Sharma. The company sends its own team to source about 45 commonly consumed varieties of fresh produce such as tomatoes, potatoes, onions, spinach, apples, bananas, etc. All of these are sorted, graded, packed and pre-priced in the distribution centre. Every day, Sabziwala delivers branded packs of fresh produce in customer-friendly half kg, one kg packs to 60-odd partner outlets across Delhi. "It saves the neighbourhood vendor the trouble of getting his produce from the mandi. It is not only time consuming, but also results in lot of wastage during transport," says Sharma. According to Srivastava, about 30-35 per cent of daily supplies are taken back at the company's cost. "These are sold to bulk buyers," he says. Incidentally, the push carts also find it convenient to buy the "old stocks", which can be sold loose at flexible prices. The farmers are also benefited as they get paid instantly at farm gate, with a premium for better quality. "We expect the farmers' average price realisation to grow at least 15-20 per cent," he adds. Sabziwala handles about nine tonnes of fresh produce every day. It is true that the quantity is nothing when compared to 300 tonnes, Safal, the fresh produce retail outlets of Mother Dairy, sells everyday in Delhi. The difference is that Safal has been in existence for the past 30 years, while Sabziwala is only a few months old, and is yet to get a major investor. The promoters have invested about `2.5 crore so far, mostly own funds and angel investments. It expects to break even in its operations in the next 12-18 months.